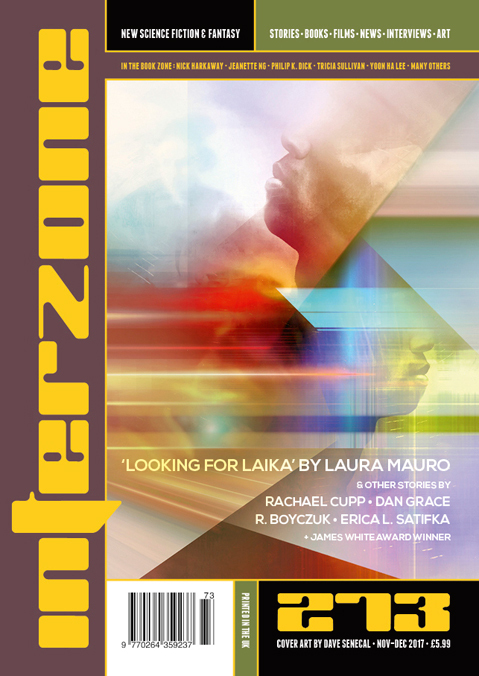 "The Garden of Eating," by R. Boyczuk [bio] (edited by Andy Cox), appeared in Interzone issue 273, published on November 15, 2017 by TTA Press. Pro: The use of simple words, like “Boy,” “Spear,” “Backpack,” etc. gives us a strong impression of Boy’s simplicity, but, as the story shows, he’s quite capable of learning, and the story essentially tells how he learned that Tutor hadn’t told him the truth and how he escaped. The turning point is when he hears the Amerigun wail in anguish when she sees he’s burned her boat and her supplies and he feels sorry he did it. Tutor’s distorted stories are amusing to listen to, but also a bit scary when you realize how severe the malfunction must be—particularly since the machine clearly wants to do some sort of surgery on Boy. The ending is hopeful. Amerigun has apparently managed to get away despite the fire, and she’s even left him something. Perhaps he’ll engage with the next visitor and find a life somewhere in the real world. Con: It never makes a whole lot of sense that a machine like Tutor would be training orphan boys and castrating them when they get older.